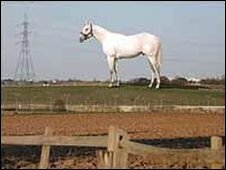 Permission has been granted for a 50m-high (164ft) white horse to be built beside the A2 dual carriageway in Kent. Gravesham Borough Council gave the go-ahead for the Ebbsfleet Landmark Project at a planning meeting on Wednesday. The racehorse, designed by former Turner Prize winner Mark Wallinger, will stand alongside the A2 and will be visible from Eurostar trains. The project team will now start the search for potential funding partners. The white horse has so far been funded by Land Securities, London and Continental Railways and Eurostar, who have injected the initial £1m to get the project started. The companies announced they would commission a £2m work of art in 2007. The aim of the project is to create a high profile marker for the Ebbsfleet Valley and Ebbsfleet International Railway Station. The sculpture will be an accurate representation of a thoroughbred white racehorse with a bridle and will be 33 times larger than a real horse. What does the white horse mean?